[S1088] Obituary ,Waynesburg Republican, 4 Feb 1909. Sarah Estle was born on 1 July 1827 at Greene Co, PA.. She was the daughter of Matthias Estle and Mary Stewart. She never married. She died on 9 March 1901 at Greene Co, PA., at age 73. She was buried at Estle Cemetery, Jefferson Twp, Greene Co, PA..
Matthias Estle Jr. was born on 29 July 1829 at Greene Co, PA.. He was the son of Matthias Estle and Mary Stewart. He married Leah Elizabeth Pearson, daughter of John Pearson and Lydia (---), at Greene Co, PA.. He was drafted and served 9 months in the Civil War, from 16 Oct 1862 to 25 Jul 1863. [S1252] 1870 Greene Co, PA. Census, Greene Twp. [S3534] Greene Co Index Quarter Sessions ,p. 216, 15 Apr 1873. John Estle was born on 20 April 1831 at Jefferson Twp, Greene Co, PA.. He was the son of Matthias Estle and Mary Stewart. He In the tax lists, he is listed as a singleman, gone to Cumberland Twp in 1857 at Jefferson Twp, Greene Co, PA.. 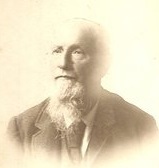 He married Olive Morris, daughter of Simon Morris and Sarah E. Cowell. He served in Co. A, 168th PA Infm during the Civil War. He lived in 1910 at Homeville, Greene Co, PA.. He died on 30 May 1913 at Jefferson Twp, Greene Co, PA., at age 82. [S1088] Obituary ,Waynesburg Republican 5 Jun 1913. (Comment: Mr. Eli Estle departed this life November 20, 1910, at nine p. m., aged seventy five years and four months. Mr. Estle’s entire life was spent in Jefferson Township On the old homestead where he died. He was the son of Matthias and Mary Stewart Estle, and was of a family of eleven children; four sisters and seven brothers, the only surviving member being John, of Homeville. He was twice married, his first wife was Miss Mary King from which union there survives but one child; Mrs. Anna Daugherty of Sugar Grove. His second wife was Miss Mary Dulaney, and to this union there was borne one son, T.R. Estle who resides on the home place. Mr. Estle was a man who was held in the highest esteem by all that knew him. He was honest, industrious, and inoffensive. He possessed a most pleasing demeanor, believing in justice and honor; and his daily life was a living example of those lofty principles. His ideal was to be in harmonious relations with everyone, and he would suffer sacrifices rather than perform an act that would disrupt the amicable relations that existed between himself and his friends. About two years ago he experienced a slight stroke of paralysis from which he never recovered. In all his sufferings he was patient and cheerful, never once taking a gloomy view of life or death. A few days before he died he expressed a desire to depart; “I want to go and be at rest,” were the words of this noble citizen. While he was not a professing Christian it seemed that the teaching of Christ had taken a hold on him, for he was trying to live according to the great rule of the Savior, “As ye would that men should do to you, do ye even so to them.” The funeral was conducted at the home November 22, by Rev. A.T. Carr, and the body was placed to rest in the family burying ground. [S1665] Letter, Linda Downer to Howard Hickman, 1995. [S1088] Obituary ,Waynesburg Republican, 24 Nov 1910. [S1251] 1860 Greene Co, PA. Census, Jefferson Twp. [S2542] Paul Jensen, e-mail to Howard Hickman, 2008 - 2015, photograph. [S1150] 1900 Monongalia Co, WV. Census, Grant District. Mary Stewart was born on 17 March 1801 at PA. She was the daughter of Jeremiah Stewart and Phoebe Cowell. She married Matthias Estle, son of Silas Estle and Sarah Rofelty. She died on 13 May 1855 at PA. at age 54. She was buried at Estle Cemetery, Jefferson Twp, Greene Co, PA..
Bertha Ward was born on 27 October 1898 at Greene Co, PA.. She was the daughter of Frank Ward and Charity Elizabeth Rhome. She married Harold Colebank after 1944. She lived in 1962 at Orlando, FL..
[S966] Weaver Funeral Home Record Charity Ward Roupe (1998 CC p.87). [S1144] Letter, Marcy Milota to Howard Hickman, 1998 to 2010. Pearl C. Ward was born on 21 February 1905 at Greene Co, PA..4 She was the daughter of Frank Ward and Charity Elizabeth Rhome. She married Ralph Hoy in 1922. She died on 2 December 1979 at Maitland, FL., at age 74. Russell Ray Ward was born on 4 April 1900 at Greene Co, PA.. He was the son of Frank Ward and Charity Elizabeth Rhome. He was a hauler in a tin mill in 1920. He married Daisy Ankrom on 7 October 1922 at Washington, PA.. He died on 26 January 1966 at Washington, PA., at age 65. Clyde William Ward was born on 7 June 1902 at Greene Co, PA..5 He was the son of Frank Ward and Charity Elizabeth Rhome. He was a helper in a tin mill in 1920 at Greene Co, PA.. He married Helen Hoy in 1924. He was a waiter in a restaurant in 1930 at Greene Co, PA.. He died on 7 February 1962 at Waynesburg, PA., at age 59. [S1088] Obituary ,Waynesburg Republican, 15 Feb 1962. Frank Ward was born on 3 September 1873 at Franklin Twp, Greene Co, PA.. He married Charity Elizabeth Rhome, daughter of Henry Harrison Rhome and Minerva J. Phillips, on 10 October 1896 at Waynesburg, PA.. He was a tin mill employee in 1920. He was a restaurant waiter in 1930 at Greene Co, PA.. He died on 16 June 1944 at Waynesburg, Greene Co, PA., at age 70. [S1088] Obituary ,Democrat Messenger, 17 Jun 1944. James Edward Strickland was born on 4 December 1882 at Brooke Co, WV.. He married Margaret Rhome, daughter of Henry Harrison Rhome and Minerva J. Phillips, before 1953.1 He died on 15 May 1962 at Washington, PA., at age 79. Carolyn Kay Donahoo is the daughter of Joseph L. Donahoo and Dale Chess. Joseph L. Donahoo was born on 25 August 1920. He married Dale Chess, daughter of Harry Richard Chess and Laura Crouse. He died on 18 October 1999 at Polk Co, FL., at age 79.